Long-term sim racers may know that Sector3 Studios staff member, Georg Ortner aka 6e66o is a huge Nürburgring Nordschleife VLN fan. Now and then Georg honors the famous German Endurance Championship with a spectacular video. 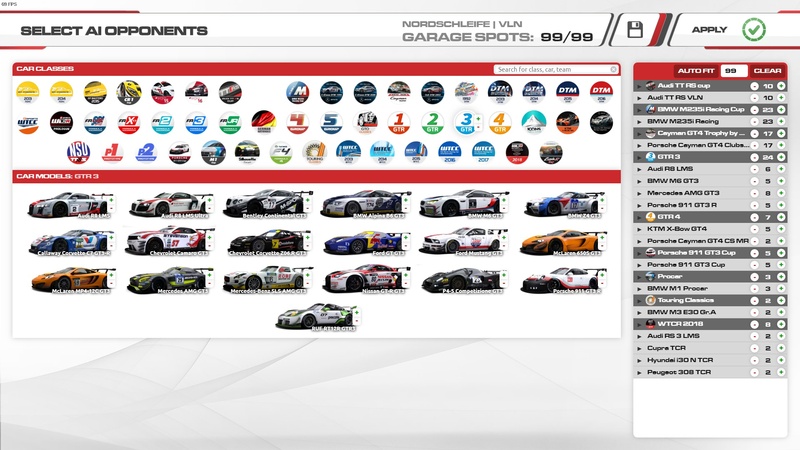 Utilizing the recently added AI filter for RaceRoom Racing Experience, George has created a massive VLN grid featuring no less than 100 racing cars. Using the AI filter, you have total control over the selection of cars you will race against on the track, down to the livery the AI will use. Sector3 Studios also reworked the AI behavior to allow them to manage the slower traffic in multiclass conditions. Enjoy the video in which Georg takes the Twin Bush Audi R8 LMS around the Nordschleife trying to safely navigate the slower traffic. It is great that RaceRoom users are now able to create their own AI filters, but keep in mind that you can also share your filter with the community. The AI filters are stored in the Documents\My Games\SimBin\RaceRoom Racing Experience\UserData\AiPresets folder. You can download Georg’s Nordschleife/VLN filter here.